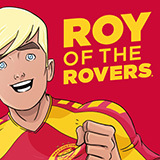 This page tells you exactly how the official Roy of the Rovers website and mobile apps collect and use data collected from users. If you want to learn more about the information we collect and how we keep it safe, read on! We may also release your information when we believe release is appropriate to comply with the law, enforce our site policies, or protect ours or others rights, property, or safety. Non-personally identifiable visitor information (i.e. : anonymous data) may be provided to other parties for marketing, advertising, or other uses. Where we share data with service providers located outside of the European Economic area we take measures to ensure that these transfers are lawful and that your rights are protected. We usually accomplish by using the European Union’s standard contract clauses for international data transfers – but if you would like to know more about how we manage these relationships then you can contact us for specific information using the contact details provided below. Alternatively, if for any reason you cannot use those links, or if you would prefer to contact us directly – you can unsubscribe by writing to us at privacy@royoftheroversofficial.com and telling us which communications you would like us to stop sending you.